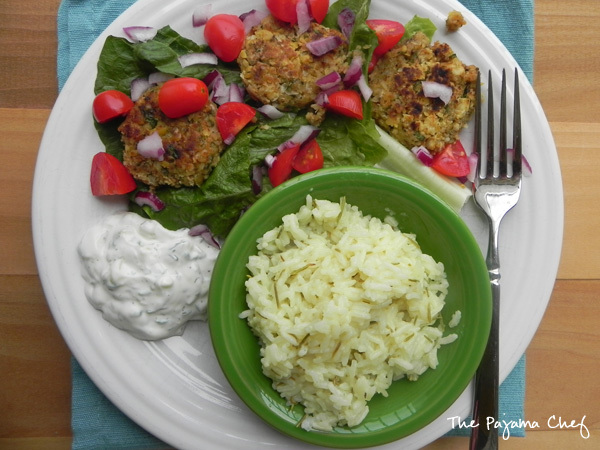 Panfried falafel served up with lots of creamy tzatziki [cucumber sauce] and a tangy Greek rice. No one said vegetarian food had to be boring! I’m so glad it’s a Secret Recipe Club [SRC] day! What’s SRC? Basically a fun blogging group where you’re secretly paired up with another blogger. 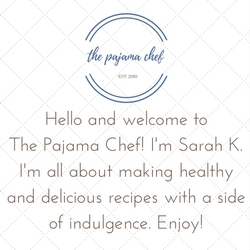 Everyone makes a recipe from their assigned blog and posts on the same day. The club has grown over the years and now has four groups. Since I first joined a few years[!] ago, I’ve been in group A. But when I had the chance to switch groups, I got SO excited because–hello!–new blogs to explore! 🙂 So now I’m in group C and loving it! 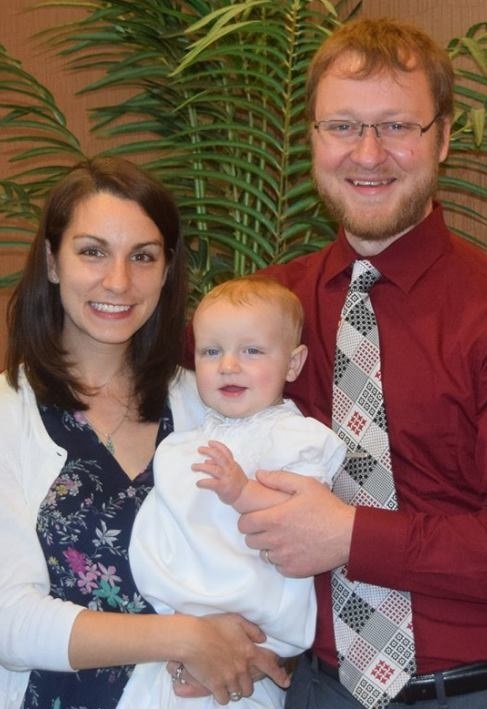 This month I was assigned to Jamie’s blog, Our Eating Habits. Jamie lives in Canada and like any food blogger, loves food. She says on her about page: “Eating is a big part of my life, so I make sure everything that goes into my mouth is tasty.” A sentiment I agree with! [And that is EXACTLY why I bought jalapeno cheetos on Saturday at the grocery store. Those are SO good. Anyway…] Jamie loves cooking and baking for her family and has an impressive number of recipes on her blog. It was so fun to browse her recipes! I was tempted to make these red velvet M&M cake mix bars for Valentine’s Day, and will make this Butterscotch Confetti at Christmastime this year! I was all set to make those red velvet bars when I saw that Jamie had a falafel recipe…and I was sold! Though I love falafel, sometimes I’m hesitant to order it at restaurants because it’s easy to make it too dry since it’s basically deep-fried chickpea balls/patties. Chickpeas are a drier bean anyway, so it makes sense. That’s why I’ve been excited to see so many pan-fried recipes for falafel lately. This recipe doesn’t disappoint! It’s so flavorful and moist [sorry!]. I changed the recipe a little from Jamie’s version, using lime juice instead of lemon, and adding the zest in for a little something special. Jamie used an egg as a binder and I decided to exclude it just so I didn’t have to worry about not cooking the falafel enough. I compensated for the lack of egg by using more chickpeas and less bread crumbs. 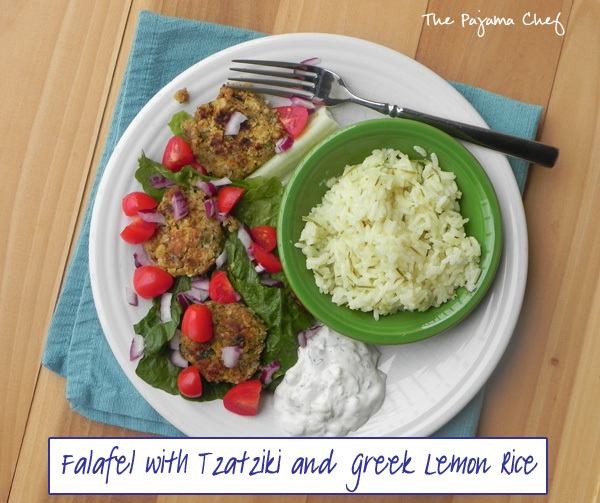 Served up with some creamy tzatziki, chopped tomatoes and red onion, on a pita or lettuce-wrap style, this is an awesome meal! I couldn’t believe how easy it was to make this tasty vegetarian meal. Jamie added mayo to her tzatziki sauce and I thought that was genius! The mayo made the sauce a little creamier and added a little extra zip, but it also tasted good without. As a side, I made a super easy lemon rice. It has just four ingredients: jasmine rice, chicken broth, rosemary, and lemon juice and is SO addictive. The bright, fresh flavor was perfect alongside the falafel. This is not a meal to be missed! Hope you try it today. 🙂 Thanks, Jamie, for a great recipe! Begin by making the tzatziki. In a medium bowl, stir together yogurt, cucumber, dill, and mayo. Taste and season with salt and pepper to taste. Cover and refrigerate while cooking falafel and rice. Next, mix up the falafel. In a food processor, pulse together onion, parsley, garlic, cumin, coriander, cayenne, lime zest, and lime juice. Then add 1/4 cup bread crumbs and 1 can chickpeas and pulse together, being careful to not completely pulverize the chickpeas. Check to see if mixture holds together, then add additional bread crumbs and/or chickpeas, pulsing gently, until mixture can be shaped into patties. I used 1/2 cup bread crumbs and 1 1/2 cans chickpeas [approximately 2 1/4 cups chickpeas]. Season to taste with pepper and salt. Shape into small patties–I used about 1/4 cup for each. Place on a plate or baking sheet and pop in the fridge to chill while starting the rice. In a small saucepan set over high heat, combine rice, chicken broth, rosemary, and lemon juice. Bring to a boil, then stir. Cover and reduce heat to a simmer, cooking for 15-20 minutes until the rice has absorbed all the liquid. Fluff with a fork and season with pepper and salt to taste. While rice is cooking, heat a large skillet over medium heat. Add oil and when hot, cook falafel patties, about 3-4 minutes per side until heated through and browned on each side. 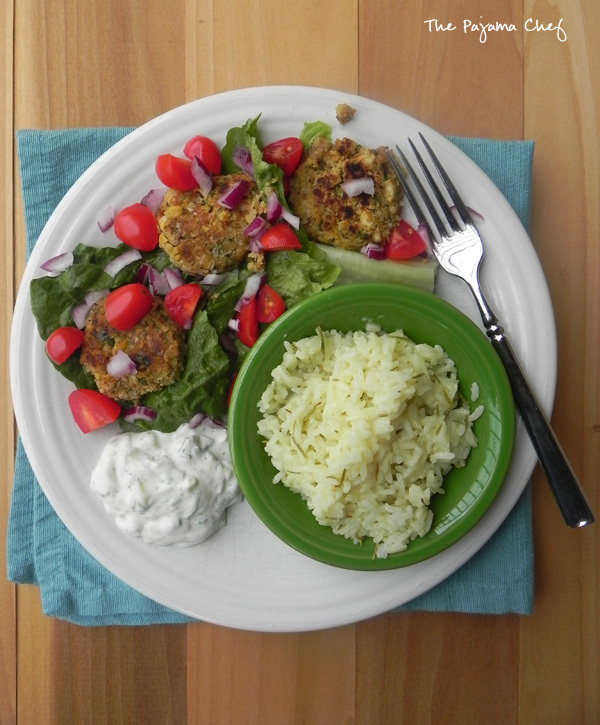 Serve falafel in a pita or with lettuce, topping with onions, tomato, and tzatziki. Rice is great on the side or in the pita too! Yum, this looks like a delicious vegetarian meal, bookmarking it to experiment with soon. Welcome to group C! So glad you liked the falafel, your plate looks lovely. I could really go for some of that right now! I am such a sucker for Greek food. This looks wonderful! Falafels are on my “to-make” list and they look super easy after reading your recipe. I can’t wait to try them! I love this choice Sarah. Like you I rarely order it for the same reason. This looks like the perfect version to try for the family! thank you, jane! i think i’ll be making falafel alot this summer 🙂 so easy and yummy! Falafels are my favorite! I’m always looking to find the perfect recipe. This sounds so good! In an awesome coincidence, I also made falafel for my last SRC reveal! Great minds… =) Love this version, and your side dishes look awesome, too. And I, too, preferred the pan-fried homemade version to the deep-fried restaurant version – so much healthier, tastier, and a better texture! I’m not sure if my previous comment got deleted, but I just wanted to say that this looks SO good! It’s like all of my favorite foods on one plate! Looks delicious!! Visiting from SRC B!